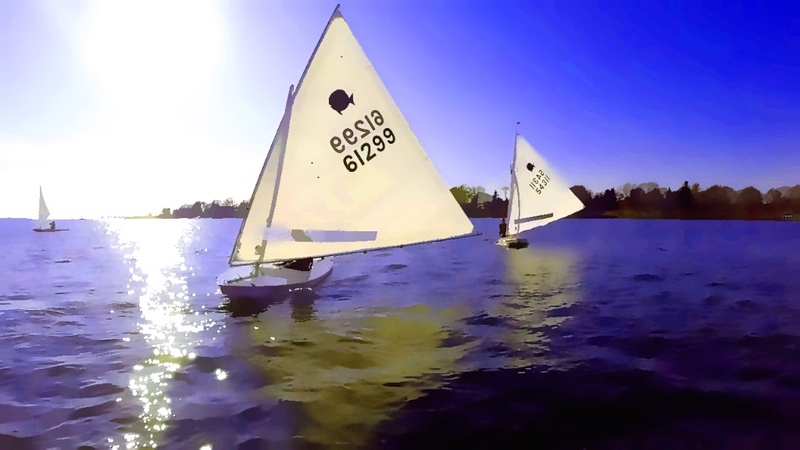 Massapoag Sunfish Fleet News: Windy Wet, Wild and COLD! Windy Wet, Wild and COLD! Twelve brave souls ventured out onto the frosty Barrington River for 4 frostbite races yesterday, where the wind speed very nearly exceeded the temperature. Temperatures were in the low 30's at race time, and the wind varied between 15 and 25 mph. Today's report is made vicariously by gleaning tidbits from race results and various emails, as your intrepid reporter was too much of a weenie to actually show up at the race course, so there may be some errors. Carnage appeared to be the order of the day, as several racers did not complete one or more races during the course of the afternoon. Capsizes were more frequent than usual, and the race committee was reported to have performed yeoman service helping out several of the less experienced skippers. Even Ken Charles ran into trouble in the last race. Scott Greenbaum took 3 firsts and a third to win the day. Bill Brangiforte came in 2nd and Bill Shaw placed 3rd. Racing continues next week. Early forecasts show that conditions should be warmer and less windy than this week. Who knows, maybe your intrepid reporter may actually race too.